With so many vaccinations available today, how do you know which ones are most important for your aging loved one? There are several vaccine-preventable diseases that pose as a threat to a person’s health, particularly those over the age of 65. Many adults do not feel the need to be vaccinated, but it is important to stay current with vaccines because some individuals may not have received them as a child. 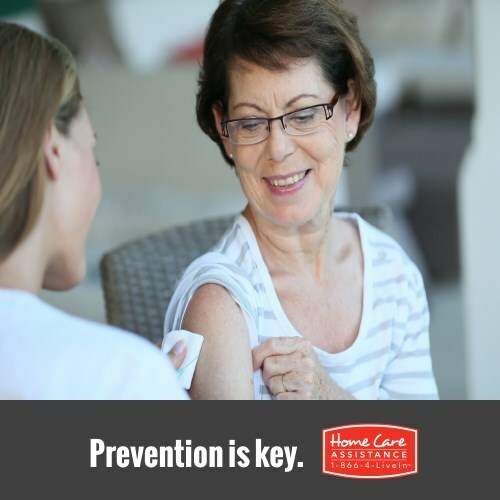 Harrisburg senior care experts, Home Care Assistance, offer a look at which vaccinations are generally recommended. Pneumococcal Vaccine – This is a one-time vaccination that is extremely important since pneumonia is on the rise in seniors and can lead to serious medical issues. Mild side effects may include low-grade fever or mild soreness at the injection site. The soreness may last for one or several days. Zoster Vaccine – This vaccine has only been available for a few years, and is beneficial in preventing or reducing the risk of developing shingles, a painful, blistering rash. More severe side effects may develop such as fever, swollen glands, breathing difficulties, or flu symptoms. Less severe effects are irritation at the injection site, mild rash, headache and diarrhea. Certain medical conditions may interact with this particular vaccination, so be sure to discuss all concerns with a health care professional prior to your loved one receiving it. Tetanus-Diphtheria-Pertussis (Tdap) – Whooping cough and pertussis are increasing in seniors, and it could be related to fading immunity. This vaccination often comes in a series, or can be used to replace one of the series of tetanus vaccines given. Side effects may include mild fever, headache, mild nausea, or joint pain. High fever and extreme drowsiness are on the list of more serious side effects. Influenza Vaccine – This is the most common vaccination recommended for seniors, and elderly should receive a flu shot annually to provide protection against new strains of the virus. Most common side effects include soreness or swelling at the injection site, low-grade fever and aches. Your loved one’s health is paramount, so be sure to discuss which vaccinations fit his or her needs with their primary care physician. Keeping seniors up to date and on schedule will help prevent disease and ensure your senior loved one remains healthy and happy. For more information on senior health, reach out to Home Care Assistance. Our experienced Care Managers can answer questions or help you find a caregiver in Harrisburg who can promote your senior loved one’s health and wellbeing. Our caregivers can provide transportation for appointments, medication reminders, grocery shop, cook, help with light housework, encourage physical activity and socialization, and support an overall healthy lifestyle. Give us a call today at (717) 540-4663 to find out more about the services available near you.